Maag, a Dover company and manufacturer of gear pumps, pelletising and filtration systems, says it has finalised a contract with Hainan Huasheng New Material Technology Co. to supply pumps, pelletising systems and screen changers for its new polycarbonate-production facility. When completed in 2020, the facility will be capable of producing up to 260 kilotonnes/year of polycarbonate (PC). This new plant will be located in the Hainan Dongfang Industrial Park in Hainan Province in southern China. Maag was chosen by Hainan Huasheng to outfit its new production facility based on the Swiss company’s commissioning of plants since the 1980s. Maag claims that upwards of 90% of the globally produced PC is done so with the assistance of its equipment. Maag says its gear pumps feature the operational reliability that is required in 24/7 production cycles and are available in an extensive range of materials of construction, which allows them to be configured to meet the user’s unique operational requirements. Product quality is guaranteed through the pump’s stable discharge rates and low tolerance deviations, which result in overall process stability, according to the company. It currently has more than 200 production lines in operation for PC plants, some of which feature a pelletising system that can produce up to 14 tonnes/hour of PC. Maag Automatik’s pelletising systems are also supplied with the Gala and Scheer pelletising brands, which are also under the Dover group of companies. 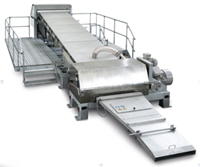 Designed for use in upstream and downstream extrusion and filtration processes, Maag says it is the only manufacturer to offer arch-type screen changers that are available as standard equipment on pressure-adaptive sealing systems. This capability ensures that the screen changeover can be completed without any costly interruption in production schedules.